From Thursday 5 September untill Saturday morning 7 September we joined a pelagic to the Botney Cut. Somewhere in between The Netherlands and Great Brittain. The weather was quite gentle, though on friday morning we had dense fog.. Nothing to see then, but the Fulmars did smell the chum we made and were tricked by the fish oil. And another nice thing: in the same area a group of Common Murre (Uria aalge) were foraging on Mackerel. The coolest part was that they were still feeding their youngsters! So when an adult caught a fish, they were actively calling for their young. Nice one! After three months of fieldwork and birding in the vast country of Kazakhstan, time to edit all the recordings and share the interesting ones. We've had a wonderful time with excellent birding, especially in the Kazakh Altai. One of my main targets in understanding bird sounds for this trip was to see whether the calls of Booted Warblers (Iduna caligata) and Sykes’s Warblers (Iduna rama) differ from each other. Of course this must have been written somewhere, but you learn more from it when you discover it yourselves. I tried to record as much ‘Iduna’-warblers as possible, but those warblers call very softly, often in short phrases and wind was always present. Therefore, not much recordings, but enough to have a clue. First of all, all recordings are made of birds which I identified myself on plumage and song. I think that the difference in call is actually not difficult to hear, but much more difficult to see and show on a sonogram. In simple words, Booted has a somewhat smacking ‘chack’-call, reminiscent of Stonechats, while Sykes’s Warblers have a harsher ‘tak’, or even ‘tok’-call, more like a soft Blackcap or Lesser Whitethroat. Of course my sample size in recordings is low, but in the field the difference was also audible and I didn't notice much variation within and between individuals. A few weeks ago I went with my girlfriend to Rome for a long weekend off. Didn't take my mic with me, but did bring my recorder! You never know. On the most beautifull day we went to Via Appia, a long and ancient road outside Rome. Although my girlfriend is not a birder, she has the patience to wait for me whilst recording. A pair of Italian Sparrows couldn't bother as well and the male was advertising just above me in a bush. I was happy! I came home, loaded the recording and to my fear the volume was doing weird things.. After each loud tone, the rest was more silent. It was really annoying to listen at. I was affraid that the recorder broke down.. So I tested everything, made dummy recordings, listened to other recordings but only these new recordings were acting weird... I put it away, little bit annoyed. Cannot imagine it doesn't differ from House Sparrow, who will work out the differences in these vocabulair rich birds? Some (many) of you knew that I was off for field work in Oman for almost two months. 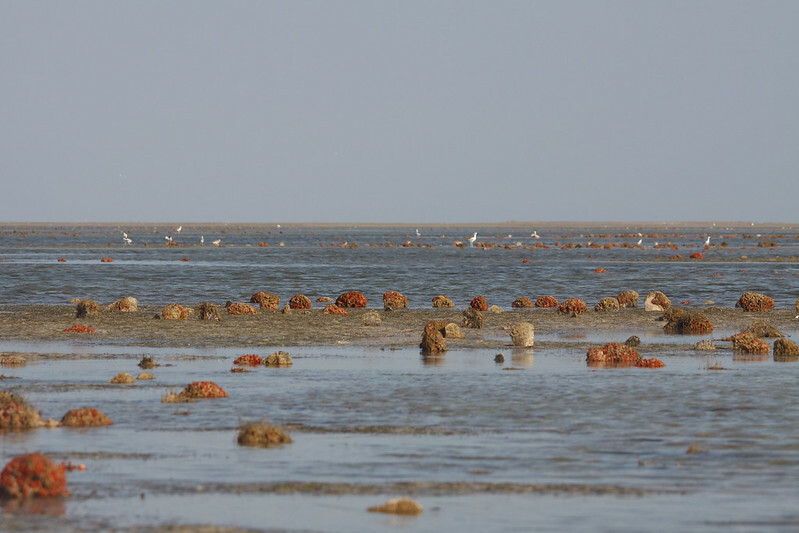 At the beginning of November I headed to Muscat and further to Barr al Hikman, a wonderfull tropical tidal mud flat. 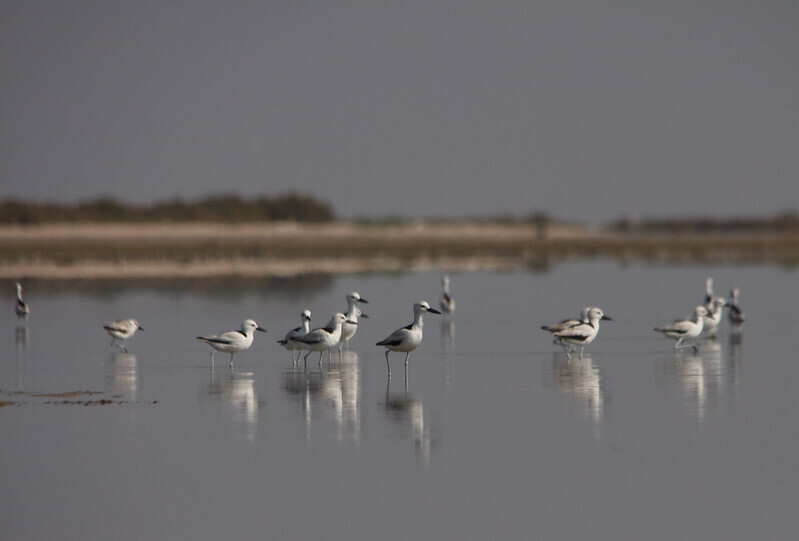 We would stay there for about 6 weeks for doing research on the stunning Crab Plover. My goal of these weeks was to film colour ringed Crab Plovers as long as possible. Easy goals and never satisfied. I came back with about 100 hours of film material. For me now the noble task to note down every step they take and how long they will handle that catched crab :). As a result I will hopefully be able to say what they eat and what they do all day. Fundamental knowledge for a better understanding of the ecosystem. It was a easy living: wake up, shorts and t-shirts on, breakfast, when will it be low and then onto the flats for filming, be back before high water and start again the next day. No people to bother us, no traffic, only birds and an occasional fly-by by the pilots of the nearby military base. The world could have been devestated and we wouldn't know. Yes, finally! Autumn has erupted and the birds are on the loose. Lucky me for spending so many hours on islands (Texel and Vlieland). I was so rather busy that I forgot to work on older recordings, let's say from couple of weeks ago.. But last weekend it was booming. A few days before, a total of 4!! Olive-Backed Pipits were present on Vlieland near the water treatment plant. So I helped Jelmer with another recording, although it was not that good (lots of people..) so I just ran away.. Find my own bird, I said. Then in the afternoon, a phonecall.. Sjoerd had found a candidate Siberian Chiffchaff (Phylloscopus collybita tristis). As I have never heard the call of a Siberian Chiffchaff in real life, I was very curious! I listened to his recording (on his phone!) and I must say: I was convinced it was a 'tristis'. After searching some time, we found the bird, sometimes calling and sometimes showing, but it was very active. I recorded some calls.. But then.. I bumped my head in very interesting matter. 'abietinus' vs 'tristis', were to draw the border..
A 'sweeo' call. Known from both 'collybita' and 'abietinus' and might occur in 'tristis' however, no guarantees. On XC this type of call has been heard (and recorded) on birds that have the plumage of 'tristis' (for what we know!) in Oman and the type of call seems to become rarer towards India. This could imply a transition zone from 'abietinus' to 'tristis', or could imply that this sound is not (sub-)species specific! Another problem: Sjoerd's phone crashed, and he had the best recording, so hopefully the recording is saved on the SD. Fortunately, in about a week I myself will visit Oman for fieldwork (watching Crab Plovers for 7 weeks) so I will be in the opportunity to sometimes record a Chiffchaff (and photograph it for the almost full documentation). (And yes, I already made a list of species where is only one or even no recording present in XC ;) ) Can, and hopefully will, do the same in Kazachstan next spring, will come back to that later. So, bad luck.. Saturday was even worse! In short: was birdwatching with Mark, worked our asses of, checked EVERYTHING, found NOTHING, and then Radde's Warbler.. New species.. 4 hours of frustrating 'I see him! AAAAND it's gone' was taking me to the limit when I finally saw it. Criticaster me was discussing about the identification when Marijn called, I ignored his call.. 5 minutes later I gave Marijn a call and he was talking about 'something really strange, no idea what it was, some pipit with an metallic call in the forest (100 meter away!!!)'. We also went in to the forest and saw a crowd yelling and screaming and go mad whilst screaming 'It's a dendroica, it's a Myrtle Warbler'. What happened? The bird just was heard calling, 30 seconds ago.... F@#$ karma.. Gave a listen to the recording, thinking about Pechora and decided to play Pechora on my phone.. Surprised looks on the surrounding people asking: what is that? What are you playing? That's the sound! Well yeah.. The sound really looks like Pechora Pipit (Anthus gustavi). However, only a few recordings are available and the sound does not match exactly. If it indeed was a pipit (bird was not seen through binoculars and only very short! ), then it must have been a Pechora. The next day, the bird was heard 3 times more, but I didn't manage to hear it. However, to my opinion, there is not enough evidence.. But we will see! As you can see it is a bad recording. However, you do see the rasp in the call, the saw-tooth ('zaagtand' in Dutch, dunno if I can say it in English). It appears that the call is broken due to quality, yes it partly is, but it's due to the softer and harder quality of that part of the call, which is given its rasping sound (more or less). Untill now, this type of call has not been documented for Yellow Wagtails (Motacilla flava incl (sub)species). And the occurence always in late autumn and with very grey-white birds, this indicates an eastern origin. Here some pictures of the bird on waarneming.nl. Well, another interesting matter: how do, for example, Yellow Wagtails from the subspecies 'beema' call? They are geographically close to M. tschutschensis.. Well, this spring I will go to Kazahkstan and as with the Siberian Chiffchaff, I hope to help with clinching the ID problems. Here some small extras. First a atmosphere sound on monday morning in the dense fog and immense migration! Rosy starling and catching up..
Enthousiastic nature lover. Started recording sounds in June 2011, but already hooked! For my recordings I use a Sony PCM-M10 recorder (pre-record and long battery lifetime!). As shotgun I use the Sennheiser ME66 with a K6 power module and a Sennheiserer MZW66 windshield. For stabilizing my shotgun, I use a Rode PG2 pistol grip. For analysing and editing sounds I use Adobe Audition and Raven Lite. This work by Thijs Fijen is licensed under a Creative Commons Attribution-NonCommercial-ShareAlike 4.0 International License. Thijs Fijen. Awesome Inc. theme. Powered by Blogger.